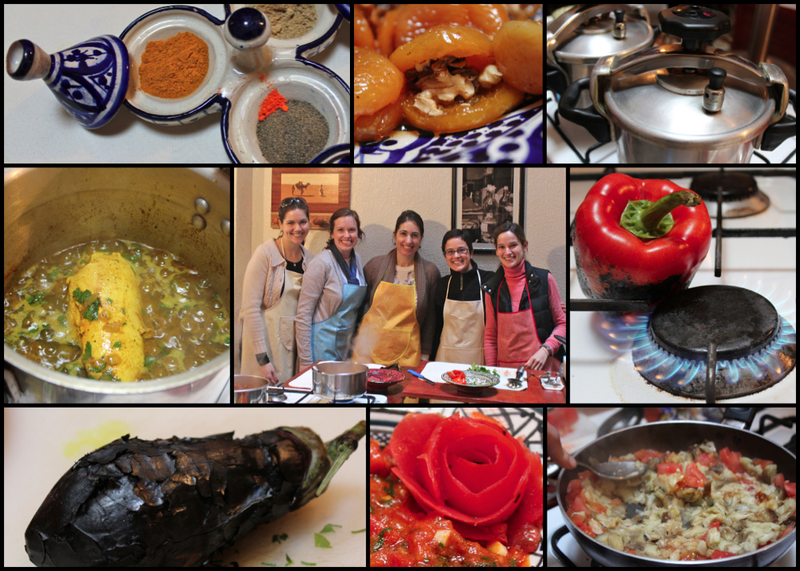 After hearing about a great Moroccan cooking school recently, my girlfriends and I decided to make a day trip to Meknes to enjoy good food, no kids, and each other. 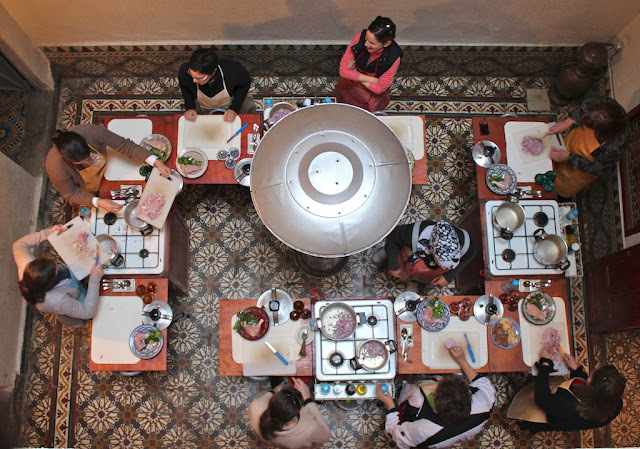 Savor Morocco is a guesthouse and cooking school catering mainly to tourists, but also to embassies and other ex-pats. Meknes, a little over an hour away, is a medieval city that was once the capital of Morocco and is full of beautiful gates and palaces. Giddy to have the day to ourselves, we loaded up the car and took off for our adventure. Of course not even a short road trip in Africa would be complete without a little drama. A couple of miles out of town we came to a detour as they had closed down the road for who knows what. We asked the guy "directing" traffic which way to Meknes and he pointed and we turned...blindly. My friends, next time you are taking a detour in the States, following all the "detour" signs that are posted every few hundred yards directing you in the right way, please be thankful. Thankfully that was the end of the trouble and we arrived on time for our class. We knew the school was run by an American couple and looked forward to meeting them and swapping ex-pat tales. What I didn't realize is that they are TEXANS. And oh dear me, she had me at, "Hah, Ah'm Aaamy". Beautiful. We were joined by three retired ladies from Georgia that were touring Morocco (go girls!). They were such a hoot and I could fill up page after page of their funny comments. However, I will leave you with just one that really sums it up: Upon seeing a picture of the King of Morocco in the hallway of the guesthouse, one of the ladies said (and please imagine it with the deep southern accent),"Amy, honey, is this your husband?" The class consisted of learning how to make and taking Moroccan mint tea in the salon with biscuits, and then we moved to our cooking stations. Some of us have more experience in the kitchen than others (don't worry, I'm not naming any names Denise) so it was a treat to be together and laugh (spill everything- me), make someone else light your stove because you're afraid of the gas (also me), add too much Cayenne making your dish almost uneatable (you guessed it, me) and most of all, have a gentleman there to CLEAN EVERYTHING UP. We made chicken tajine and a hot vegetable dish called Tk'touka. And then we gobbled it up. Oh, and bonus, also learned how to make a rose out of a tomato skin. And that's about it. The Moroccan girl that instructed the cooking did a fantastic job, spoke great English and was willing to answer any questions about Morocco. She even showed us how to put on a head scarf at the end! And then we drove home with very full and satisfied bellies. As we would say in Texas, Savor Morocco is a mighty fine establishment! We had a great time and hope to share it soon with our visitors. Thanks Amy and Chris! P.S. Thanks for the photos, Denise. WISH I could take photos like you!! !